"I waaaaaaant a Princess Tiana doll!" "I waaaaaaant a Princess Tiana cup!" Those are Sabrina soundbites from our foray on Sunday to see The Princess and The Frog. Dave got us tickets for a special preview of the movie. 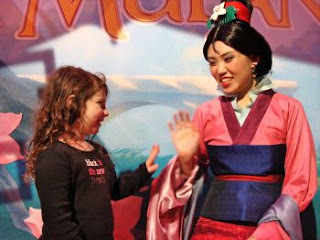 It was followed by The Ultimate Disney Experience, where you got to go and meet all nine princesses, do crafts, see some Disney archive stuff, learn how to make animated movies, and mingle with hundreds of other little girls with princesses on the brain. Sabrina and I both enjoyed the movie. 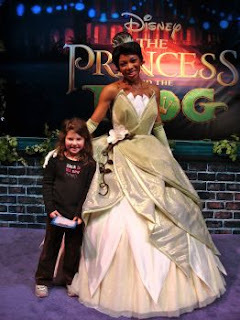 And she was excited to see all of the princesses afterward, especially the new princess, Tiana. About time Disney made an African-American princess. So, it was a nice day, except Sabrina kept waaaaaaanting stuff. Which made me worry that we're spoiling her, especially Dave. Forget her little finger—she has her Daddy wrapped around her entire body. He has been known to walk in the door on weekends carrying some new toy for Sabrina, and when I ask him why he'll say, "Because she told me she's been wanting one and I promised it to her!" Uh-huh. I'd already told Sabrina in advance we weren't getting her a doll, but that didn't stop her from waaaaaaanting one. Or all the other merchandise. Inevitably, I started thinking about Max. We spoil him to some extent. When a therapist recommends a toy that could help him—say, a remote-control truck that will help him learn to press a button— we typically run (not walk) to the store to get it. But since Max can't fully express himself verbally, there's no "I waaaaaaant"-ing from him. Occasionally, if we're watching TV and a commercial for a toy truck comes on, Max will point to it. I'll say, "You want Mommy to get you that?" and he'll nod and say "YES!" For the holidays, I'm planning to sit him down at the computer and show him a few things I think he'd like and let him vote yay or nay. Sabrina's been telling me what she wants since the summer. But the truth is at this point, both my kids have more toys than they need. And I don't want them to think the holidays are just about gifts. So we're going to take some unopened toys we have and give them to a realty agency down the block that's doing a toy drive; I've been talking with the kids about giving toys to kids who don't have money to buy them. I'm also going to find a local soup kitchen or shelter we can go help at around Christmas, or at least deliver food to. And I am limiting what we get them for the holidays, which also fall around their birthdays—Max's is in mid-December, Sabrina's is in late January. My basic challenge: keeping Dave under control. How do you handle the whole don't-spoil-the-kids thing? I'll admit it - we spoil Daniel, especially when it comes to therapy toys. Like you, we run out and get anything that we think could help his development. Case in point: the real drum set he got as a toddler. I'm a little bit better than my husband when it comes to not giving in, but I'm really not that far behind him. We try to give away the unused and outgrown toys. We also try to sell some on Ebay to raise money to buy toys for, as Daniel says, "Kids who don't have parents or houses." I'm hoping that doing so will counteract some of the spoiling. My paycheck keeps the spoiling in check, to be honest! When they get "I waaaant"-ing all over the place, I start whining that "I waaaaant" a new car or a new computer. That kind of makes them step back, and they get it--if the money's not there, they can want all day and it's just not happening. I am pretty lucky, though--they never seem to want expensive stuff. Of course, they're not exposed to a lot of expensive stuff either, so that helps the situation. They don't suffer, though, not by a long shot--they have "enough" toys (they get pretty nifty gifts from uncles, aunts, grandparents and great grandparents, and Grammy does the coordination so they don't get the same thing from two different relatives)--not tons, just "enough"--and if they don't use it, it goes to the toybox at Grammy's for awhile, and then to the Salvation Army. Ironically, the toys they like the best are the puppets Grammy makes for them, the barrel of crayons they have accumulated, and the red rubber ball. They also REALLY like the fort they built out of appliance cardboard boxes that is the neighborhood eyesore on my porch (I keep waiting for it to fall apart, but no luck, yet). Let me know when you figure it out. I am contemplating a massive toy removal pre Christmas because we have so many toys and getting the kids to pick them up is torture. Things are so much nicer when they have fewer things to play with and pick up. Emma is an only child. I too can relate to running out and getting whatever toy anyone recommends that might help her. Emma, like Max, can't really express herself with words enough to beg yet. I do exactly what you are doing with Max, let her pick from choices. Of course, almost everything ends up in a YAY vote. She wants everything. When given two choices, she always says both. We give in too. Emma is more physically disabled, so finding toys that she play with well enough to justify costs can be a challenge. None the less, somehow the toys are coming out of everywhere around here. I don't know how to NOT spoil her. I, too, clean out each year about this time. I always ask her if it is okay to give her toys to needy kids. She is okay with that most of the, so at least she is not totally selfish. That is a least good, right?? I did the massive toy removal today, actually, and was unnerved to see just how much we'd accumulated! I was so happy to give two huge bags to The Salvation Army. Felicia, that appliance-box fort on your porch sounds like a sight to be seen! When I talked with Sabrina tonight about giving toys to kids who don't have any, she said, "But all of my friends have lots of toys!" Clearly, we have a ways to go. Ha ha! Charlie's so spoiled it's a joke among the therapists. Although, honestly, I'm a lot better than I was when he first figured out how to push a button. In my family, however, Charlie is the only child, and the only grandchild on both sides. Makes it tough not to spoil. Also, I was spoiled rotten, so it's not like I've got a good compass with these things. But I try. Day at a home for mentally ill adults, I talk about people who need help, and so on, but we are just at the beginning of that understanding. Probably the most important thing I do is not show my kids commerical television. We DVR the shows Claire likes and we watch movied, but she doesn't see the barrage of ads and I hope that helps with the I WAAAAAAAAANT problem. When I'm out w/ my 4 yo daughter, and she finds something wonderful that she would like to bring home and asks can she buy it, I say "sure! did you bring your money?"... Inevitably she says no, and I encouragingly say "oh, too bad, well maybe next time!". Try it-it feels fabulous! I don't think you're spoiling Max because you are, trying to help him learn stuff at the same time. (if the therapists reccomend it).